This shop has been compensated by Collective Bias, Inc. and its advertiser. All opinions stated are my own and are not influenced by any affiliates. #HouseofBBQ #CollectiveBias This content is intended for readers who are 21 and over. What's the first thing that comes to mind when thinking about a BBQ? Burgers? Hot dogs? Ribs? Me personally, Pulled Pork Sandwiches. I can thank my mother for that. Every party she hosts, she makes her famous BBQ Pulled Pork. I decided to put a personal touch on her recipe (with her permission of course) and make BBQ Pulled chicken and the biggest twist, I am using Blue Moon! Yes, beer. I will also be using my Slow Cooker for this recipe which is a great for a BBQ, so you have more time to focus on other dishes and entertain your guests! I like being able to go to ONE store for all my needs and Price Chopper does just that. 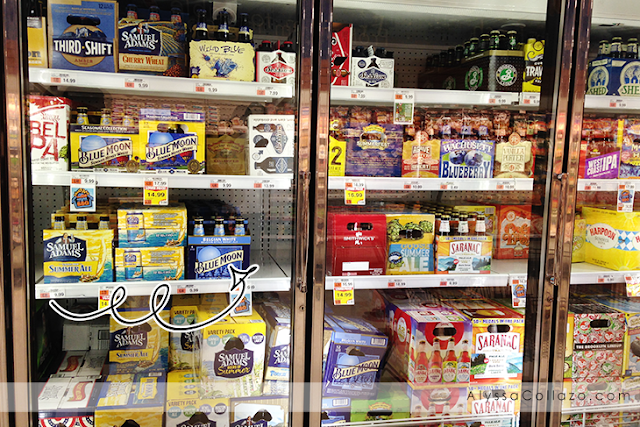 From meat to beer, they have it all. It's my weekly grocery store of choice. I used a beer I enjoy on a regular basis for this recipe and I like that Blue Moon Belgian White has a Orange taste. Which paired perfectly with my recipe and the spices I used. My chicken turned out tender, juicy, sweet, and full of flavor with the help of spices, Price Chopper Sweet and Honey Barbecue sauce, Blue Moon and Tyson Thin Sliced Chicken Breasts. In a crockpot, add BBQ sauce, brown sugar, and spices. Slowly stir in Blue Moon Belgian White until completely mixed. Add chicken, cover, and cook on low for 3-4 hours. I flipped the chicken breasts halfway through the cooking process, but this is entirely optional. Just make sure chicken is cooked through to the middle. Use two forks and shred the chicken. Feel free to add toppings like Cheese and Serve. I paired mine with Chips and a bottle of Blue Moon Belgian White. 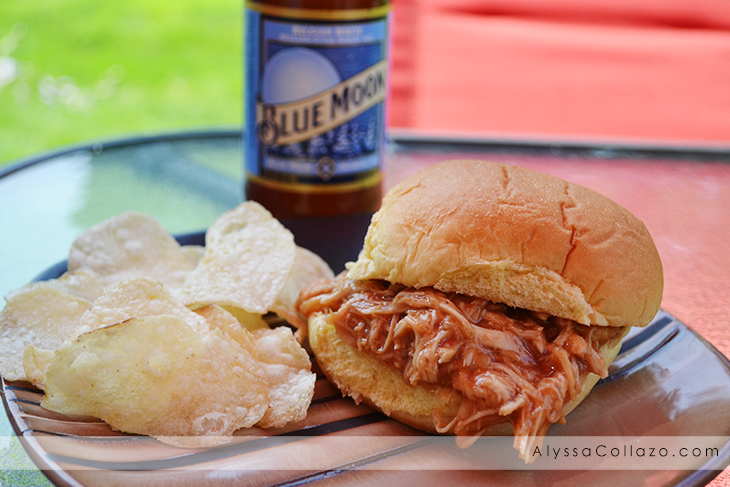 And there you have it, Blue Moon BBQ Pulled Chicken Sandwiches. These Sandwiches were a HUGE hit and I can't wait to make them again. My fiance and I enjoyed a delicious Blue Moon Belgian White after a full day of Cooking, Cleaning and Entertaining. We can't wait to see what some of our local places like Chicago Sam's, Wood-N-Tap and The Yarde Taver pair or garnish Blue Moon with. For more #HouseofBBQ inspiration, be sure to check out Price Chopper's Pinterest Board! My husband would LOVE these! I am totally going to make these for him really soon! He's going to flip! That is fantastic! I live in Georgia, land of pulled pork, and I love to cook with beer. It gives such a great flavor, and it make everything so tender! I love pulled pork sandwiches! We had them for my daughter's HS graduation party 2 years ago...I can't believe it's been 2 years already! I am gonna have to buy some pork and have more. My husband is obsessed with pulled pork. I think I may have to try and make this for him, thanks for sharing! I love crock pot pulled pork! It's such an easy recipe, and so easy to multiply for when company shows up. I've used it to feed 30+ teenagers before :-). It disappeared REALLY quickly! We love pulled pork sandwiches, I'm sure we'll love the chicken version, too. I can't wait to try your recipe. Yum! Those sandwiches look amazing! And so easy to make! I think my hubby would totally love these and I"m loving that they are so simple! I think I need to get these Blue Moon BBQ Pulled Chicken Sandwiches in me belly ASAP, thanks for sharing, YUMMO! So does this taste like alcohol/beer once it's cooked? My bio dad used to cook with alcohol and I just can't remember what it tastes like. I don't really like beer, the taste or anything like that, so I haven't tried cooking with it. Yummy! I got to have me some of these BBQ sandwiches. My hubby would absolutely love this recipe! I will have to try it soon! Ooh I do love a good pulled chicken sandwich. 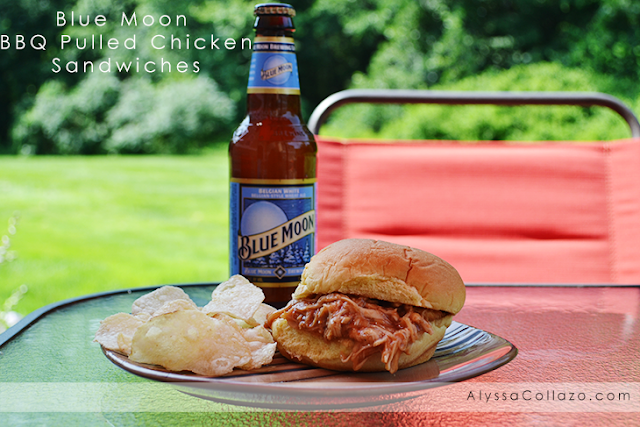 The Blue Moon and delicious barbeque sandwiches sound like a great combo. These BBQ Chicken Sandwiches sound fantastic! I just made today pulled pork, coleslaw and baked beans; I'll have to substitute for chicken next time and try your recipe...sounds perfect! Nothing says summer more to me that an ice cold Blue Moon! I need to try these pulled chicken sandwiches as well, they look yummy!! Blue Moon is definitely my favorite beer! I will need to make these sandwiches - perfect for weekends! What a great recipe! I have never heard of Blue Moon re a beer, so will have to be on the lookout for it! Thanks for highlighting the brand! If the title contains BBQ, my husband is in. 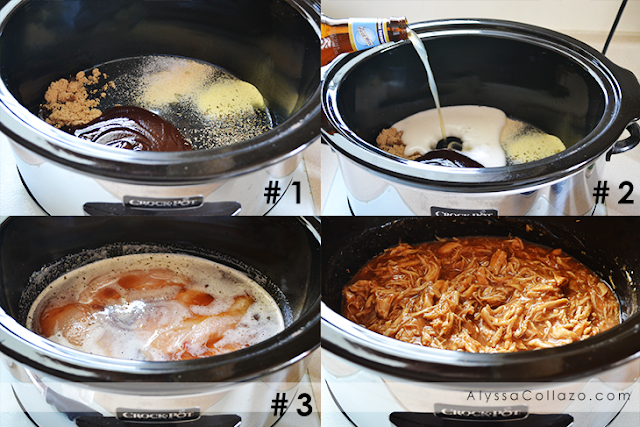 This looks like a delicious recipe to try and I love that you use a slow cooker. Looks like good summer fun eating to me. I know two big Blue Moon fans! I've been seeing recipes with beer as one of the ingredients, but I haven't tried making one yet. I love me some beer every now and then. I am so interested to try your recipe. This looks like a very delicious sandwich and I’d love to try it! Thanks so much for the recipe! Yummmy! I love that you incorporated beer into the recipe, I saw another recipe recently that did the same thing with a cheese dip. My step mom does this with a corn she cooks as well. 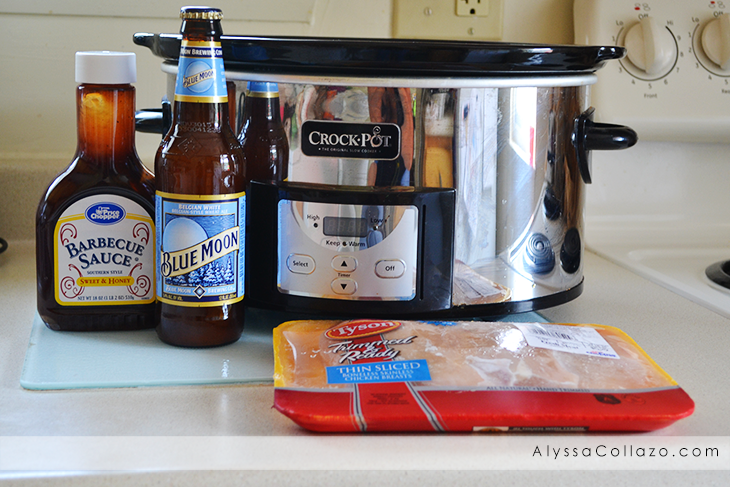 Oooo I never thought of making pulled pork with blue moon! Totally going to have to try this out since I love me some Blue moon! That looks perfect. Our family likes pulled pork recipes but we haven't done one with beer so this is something that I'd like to try for one of our family dinners. I'm sure it will be a hit. I am having a BBQ this weekend and this would be perfect to have as an option. I am going to test the recipe this week. It looks so delicious. The pulled pork sandwiches look delicious. I haven't tried making them. I personally don't care for beer but my husband enjoys it ocassionally. I've never cooked with beer before but would love to try. This sounds like a very nice recipe. This looks so easy to make and of course delicious! I would like to make this for my next picnic!